I really enjoy the gardens at Cantigny. There are beautiful flowers and many insects. I went recent and found many bees, wasps, butterfly and other beetles everywhere. I was out with the macro lens and took many photos which I'll be sharing over the course of the next week or so. Today I am focusing on wasps. 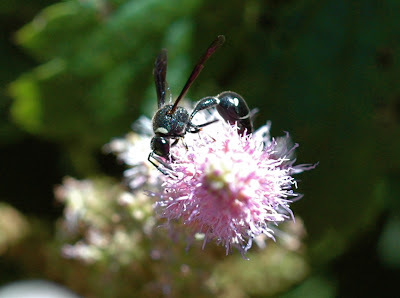 Wasps, bees and ants are of the order Hymenoptera. 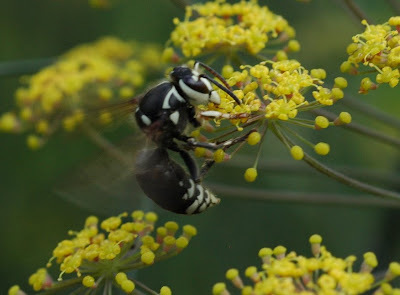 Unlike bees, wasps do not collect pollen and are mostly carnivorous or scavengers. 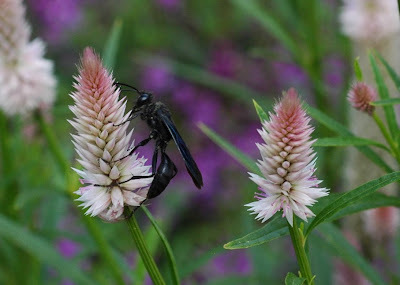 Still, they are beneficial to a garden as they help control problem insects. Wasps are characterized by their thin waist and unlike bees, which are furry to help collect pollen, wasps are generally smooth. Some wasps are social, such as yellow jackets or bald-faced hornets, others are solitary such as the parasitic wasps. Many social wasps live in complex societies that are even more complex than bees or ants. One last point, wasps do not play a big role in pollinating, they play some role but it is minor. Also, unlike bees, wasps do not gather pollen. Instead they go to flowers to drink the nectar. Hope you enjoyed the wasps. I am typically afraid of these creatures but as I take more photos, I become less fearful. Tomorrow I will feature a honey bee who was frantically gathering pollen. Absolutely breathtaking! I (http://whatasiteforsoreeyes.blogspot.com/) could use some tips from you! Nature & animals are my passions too + I've recently developed an interest in photography. Thank you. What tyips do you want? My advice is take as many pictures as you can. Practice is the best teacher. :-) But you can always e-mail me at theshutterbugeye@yahoo.com if you want. I am also afraid of these guys however the photos are great especially to be able to capture all the details. Yikes! Wasps are one thing I'm a little wary of! However, your photos of them are gorgeous, and I can see their beauty through my fear!! :-) Thanks. They were so focused on drinking nectar that they barely noticed me. At one point I took a closeup of the hornets face (see my flickr for that) and it moved and I jumped about 10 feet as I had the camera right by it and with the macro it was magnified so when it moved I was sure it was on my forehead or something. But really, they didn't seem to even notice me.